I love squash for so many reasons. At first of all, they have great health benefits, and they are low-calorie and low-carb. 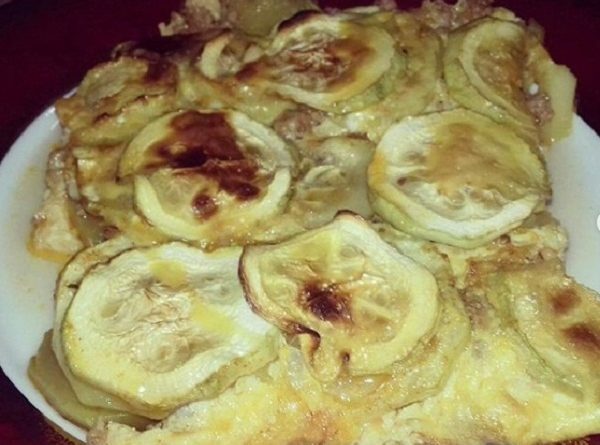 So today, for lunch, on my table will be squash/zucchini moussaka. I love dairy-free options. Therefore this zucchini moussaka is Paleo, low-carb, keto, dairy-free, sugar-free, gluten-free, and grain-free. Using a wooden spoon, saut the onions until translucent. Add the meat and continue to saut until lightly browned. Add black pepper and salt to taste. Mix well. Place a layer of zucchini slices and spread the meat mixture evenly on top. Bake for 30 minutes, then sprinkle the egg mixture ( 3 eggs + water) over the top and continue to cook for another 15 to 30 minutes, until golden brown. Moussaka is traditionally eaten warm, not hot.